The story behind the case was the publication of an article by the satirical magazine Private Eye that included a confidential memorandum leaked from The Observer. The memo had been written by the journalist Nora Beloff (1919–1997). Some commentators have suggested, as the judge did at the time, that the dispute should have been brought as an action for breach of confidence. However, Beloff sued for copyright infringement. In fact, although she seems to have had the support of her employer, the newspaper was unwilling to take action itself. 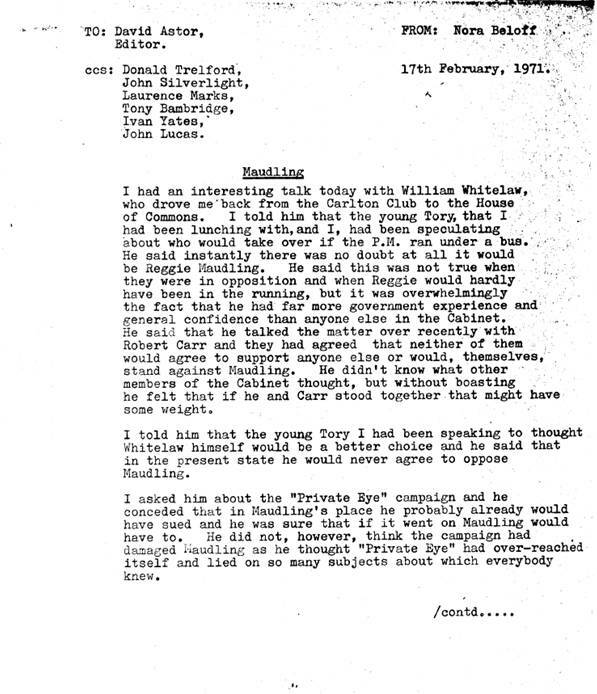 Perhaps the main reason behind such unwillingness was that Fleet Street newspapers were reluctant to enter into disputes with one another, and even less so with the Eye. The tacit rule that ‘dog does not eat dog’ might well have been observed in this case. It is also plausible that one of the reasons why her employer did not sue was to avoid other trouble at their office: the controversial leak could have been an inside job. In October 1972, Ungoed-Thomas J., held for the defendant. 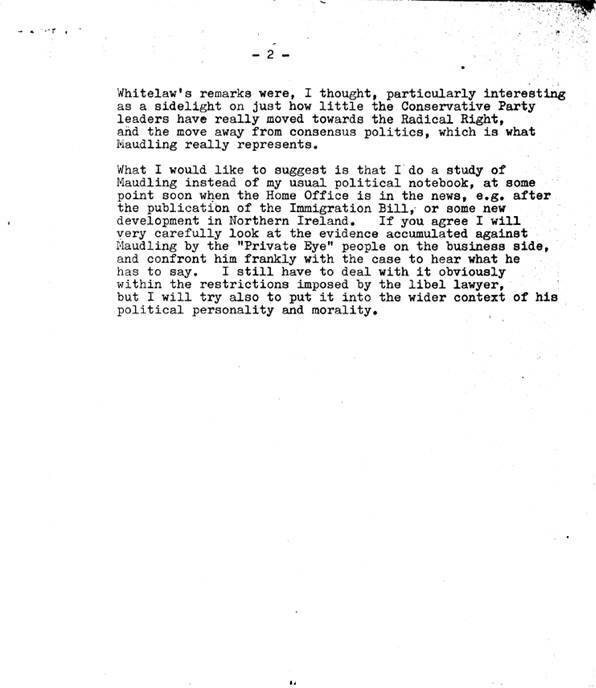 Beloff’s claim was rejected on the basis of lack of title because the confidential memorandum was considered a work made in the course of employment, which thus belonged to The Observer rather than Beloff. 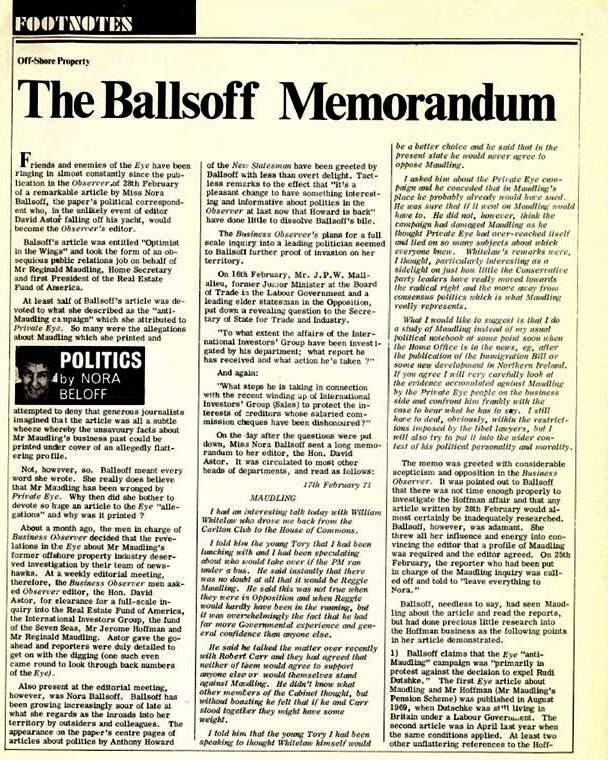 The strategic copyright assignment made by the newspaper editor, David Astor (1912-2001) to Beloff just before the writ failed, as Astor was not the copyright owner and had no authority to make such assignment. The Court also considered the defences of “public interest” and “fair dealing”. Importantly, the court recognised a public interest defence to infringement of copyright, but found it was not made out as the memorandum did not disclose inequity or misdeeds. He also held that the dealing was not fair because the document had been leaked. Here we have included both the copy of the memorandum that survived in the archives and the article from the Eye.